Testing cognitive function is a critical aspect of mental state examination because, with the exception of problems with attention and concentration, impaired cognitive functioning should be taken as an indicator of organic brain disease. A few simple tests should be enough to exclude major problems or alternatively to pick up pointers that further investigation is warranted. One commonly used scheme, the Folstein Mini Mental State Examination (MMSE), arguably has a number of disadvantages. Some of the tests used are quite insensitive so that quite severe impairment must be present before it is picked up. Conventionally, a total score is given such as 23/30 without any encouragement to report which individual items are problematic. Some items test attention and concentration and hence are not specific to organic brain disease but they will still contribute to the overall score. The tests presented here are chosen to be sensitive enough to pick up moderate as well as major deficits in functioning. They also allow one to make a judgement as to whether any deficit appears to be focal, patchy or diffuse. This clearly has important clinical implications. If all the impairment of functioning can readily assigned to one area of the brain, for example impaired frontal functioning or isolated naming difficulties, then this may suggest a space-occupying lesion or a cerebrovascular event. If two or more separate brain areas are implicated then this may suggest multiple infarcts or metastases. If there is global impairment with reduced short term memory, disorientation and visuospatial problems then this would be typical of a degenerative process such as Alzheimer's disease. One would not do all of these tests on every patient. On the other hand, it is advisable to gain experience of using them so that one acquires an idea of what is normal and also to become practised in asking the relevant questions. In clinical practice a fairly full assessment of cognitive functioning might just consist of testing orientation, short term memory, naming, cube-copying and verbal fluency. If a patient performed well on these it would be unlikely that significant problems were present. Reports from the patient and informants can be used to complement the findings from direct assessment, for example that the patient has problems dressing or commonly wanders and gets lost. These notes are not intended to be full descriptions of the tests and their interpretation but more to act as a reminder. This testing can be done quite quickly and the results can also be presented concisely while still preserving all the relevant information, for example: "Fully conscious, orientated for date, day and place. Recalled 5 out of 6 items of a name and address at 2 minutes. Could name pen, point and clip. Named 20 animals in a minute. Copied cube OK."
Note level of consciousness. Remember that impaired or fluctuating level of consciousness is hallmark of acute organic brain disease. Unlike other problems with cognitive functioning, impairment of attention and concentration does not indicate organic disease - for example it can occur if the patient is anxious or distracted. Its importance is that it can account for poor performance on the other aspects of cognitive testing. Arguably, one can only be confident that there is genuine impairment of some other aspect of cognitive function if one has first demonstrated intact attention and concentration. You may have formed a good assessment of this in the course of obtaining a history, in which case there may be no need for formal testing. Ask the patient to subtract 7 from 100, then take away 7 again, and so on. The point is that they are able to persist with the task so it is not satisfactory if they just rattle off a few quick answers and then stop, they should be encouraged to continue. Nor is it supposed to be a test of calculating ability so it does not matter if they make minor mistakes and if subtracting 7's is too difficult they should be asked instead to count up from 4 in 3's. Ask the patient to spell WORLD backwards. Speak a string of digits, one per second, then ask patient to repeat them. Record the longest string they can manage. Can also ask them to repeat them backwards to get reverse digit span. Orientation is a key function which is expected to be impaired if there is any global or diffuse brain disease. Record if the patient can tell you the day of the week and date. If they cannot manage that accurately, do they know the month, season, year, decade? Can they say where they are? If not, do they at least know what kind of building they are in, for example hotel, hospital, prison? Do they know their name and can they remember yours? Like orientation, short term memory is expected to be impaired whenever there is generalised brain disease, although it can also occur as an isolated problem in amnestic syndrome. What is meant by short term memory in this context is the ability to recall information which has been learned minutes to months previously. Thus it differs from registration, which is the ability to acquire the information in the first place, and immediate recall, the ability to repeat it. These functions can be affected by non-organic problems whereas problems in recalling previously learned information are indicative of organic brain disease. Ask the patient to learn a 6-item name and address (e.g. Mark Fisher, 257 Woodstock Road, Portsmouth). Say the whole thing and get them to say it back. If they make any mistakes repeat the process. You can try a few times. If it seems that they cannot manage to learn it then you can instead get them to learn three objects (e.g. book, table, horse) using the same procedure. When they have managed the learning tell them that you will ask them again in a couple of minutes then get on with other tests to prevent them rehearsing. You can record how easily they learn the name and address but remember that the significant issue is how well they recollect the information subsequently. After 2 or 3 minutes have passed and you have done other tests, ask the patient to tell you the name and address and record their response as e.g. "Recalled 5/6 items at 2 minutes". Point to objects and ask patient to name them. Choose objects with increasing order of difficulty, e.g. watch, strap, buckle or pen, point, clip. If it seems that there might be subtle problems, try somewhat harder tasks, e.g. dial, handset, stethoscope, buttonhole. It may not be necessary to test comprehension specifically if it is clear that the patient understands you well. If you do need to do a specific test you could say "Pick up that piece, of paper, fold it in half and put it on the desk" though this is also a test of sequencing ability. Problems with the frontal lobe can be manifest as apathy or social disinhibition as well as problems in producing flexible responses or purposeful sequences of actions. Ask the patient to name as many animals, or as many words beginning with S, as they can in one minute. If they stop prematurely, gently prompt them to continue. This is a sensitive test of frontal lobe function and people with frontal impairments will typically do badly in three ways. They will produce a smaller total number of responses. They are may repeat responses they have already made, sometimes amounting to perseveration. They find it difficult to switch categories and will typically produce all their responses from one set of animals, e.g. "Dog, cat, mouse, … dog, did I say mouse?" etc. Ask the patient to give you a rough estimate of measurements of objects you point out, for example the height of a book or the weight of a phone. People with frontal impairment can produce wildly inaccurate results. Say to the patient "Pick up that piece of paper, fold it half and then put it on the desk". Say to the patient "When I tap once, you tap twice and when I tap twice, you tap once". Then go through tapping either once or twice on the desk. You may need to explain the task again a couple of times. Patients with severe impairment may either keep producing the same response no matter how many times you tap (perseveration) or may always tap the same number of times as you (echopraxia). Impairment of these functions may suggest occipito-parietal problems. 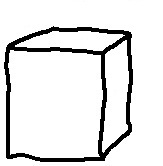 Draw a cube and say to the patient "Copy this". This is a sensitive test for diffuse brain disease and patients with fairly mild Alzheimer's disease will typical perform very badly on it. Ask the patient to draw a clock face with the numbers from 1 to12 in the correct places. This is quite a demanding task. Patients with visual inattention will typically crowd all the numbers into one half of the circle. Ask the patient to put their hands behind them and to recognize an object by touch, such as a pen or a key. Failure to do this correctly is termed astereognosis. Hold up both index fingers and ask the patient to tell you which one you move. Move one, then the other, then both. Ask the patient to hold out their hands palm up and tell you which hand you tap while they have their eyes closed. Tap one, then the other, then both. Ask the patient to show you their left hand, then touch the left ear with their right hand. Put two different coins in your hands and ask them to name the coin in your right hand. Copyright Dave Curtis 2011. You can distribute this material freely provided my copyright remains acknowledged.